The poorest country in the Western hemisphere, Haiti has a persistent and crippling problem with hunger and malnutrition. According to the World Food Program, about 44% of the Haitian population is undernourished. With few resources and little government support many poor families rely on outside help from programs like ours. We support a rescue center for malnourished children in a rural part of Haiti and a feeding program in Port-au-Prince, in a neighborhood that has still not recovered from the 2010 earthquake. The rescue center treats children of all ages and with a variety of conditions. Most common, however, is kwashiorkor, a life-threatening form of malnutrition that results from protein deficiency. Children with this condition require extensive care with special nutritional supplements to fully recover and regular balanced nutrition to stay healthy afterwards. However, all too often, the kwashiorkor recurs because parents just don’t have enough food for their children (or themselves). Many times a drought or storm is enough to destroy the basis of a family’s livelihood, especially in the rural areas where subsistence farming is very common. That’s why our project partner not only works with the sick children but often helps improve the family’s situation with follow-up care, training, food aid, scholarships, and free medical care for the whole family. In Haiti, the geographic location, extensive destruction of the environment and poor infrastructure converge to make the population extremely vulnerable to natural disasters. Haiti The poorest nation in the Western Hemisphere. However horrid conditions are in the cities, it is far worse out in the rural areas. What little resources and government aid that is available does not reach these people, so they are utterly dependent on the help of charities such as ASC. The rescue center that your generous donations help support treats children of all ages with various illnesses, traumas, and diseases. The most common disease is kwashiorkor: a form of severe protein–energy malnutrition characterized by edema, anorexia, ulcerating dermatoses, and an enlarged liver with fatty infiltrates. She is 13 months old and living with her grandparents. There are 12 people in a 2-room house that has no running water or a flush toilet. This is her second time with kwashiorkor, which is not uncommon, as families do not make enough money to provide nutritious meals. The day she was admitted all she had eaten was some peanut butter. The day before that, she had oatmeal. When she was admitted she weighed 22 lbs. Sine then, she lost 7 lbs of edema from her kwashiorkor. 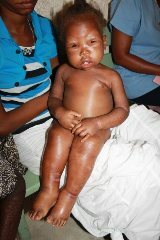 If you would like to help save more children like Emanise please click here. While the situation for many people in the rural, mountainous areas is disastrous, the city of Port-au-Prince is often not much better. Years after the earthquake, a large part of the population still lives in tent camps and there is very little hope that this will change any time soon. This is especially hard on the many children stuck in a place without adequate sanitation, clean water, sufficient food, solid housing and education. Safety is another big concern in these makeshift compounds. Our second Haitian project provides some much needed relief for these children. Every weekday children from the surrounding communities come to our partner’s feeding program in a poor neighborhood of Port-au-Prince to eat a nutritious meal and spend time with other kids and adult mentors in a safe place. Currently, there are 1700 - 1800 hungry children who show up every day for a healthy plate of food; for most, it’s the only meal they eat all day. In addition, the children get a couple hours of relief from hardship – they get to be carefree kids who play with other kids, fill their tummies with good food and have adults check in with them. In the case of these Haitian children, a plate of food is so much more than ‘just’ sustenance - it’s happiness, safety, joy, hope and nutrition! Our project partner further provides scholarships, an after school program and a summer camp to help enrich the lives of these deserving children. There are also plans for building a school to create a permanent presence in the neighborhood. Jn’s father carried him five hours, up and down mountain paths, to bring him to the clinic. Jn is 7 yrs old and suffering with kwashiorkor. He weighed 50 lbs when he was admitted. He has since lost 20 lbs of water weight. As Jn also lives in a 2-room house with 11 other extended family members, the challenge is to ensure that Jn maintains the proper diet to fight off another bout with this disease. This is why the rescue center also provides follow-up care, food aid, scholarships, and free medical care, both to Jn’s family, as well as many others. It is because of your love and support that we are able to help so many children and their families throughout this region. A heart felt thank you for making this possible!